The undeveloped shoreline at Kawa on the island of Hawai'i protects nesting areas for the critically endangered Hawaiian hawksbill turtle. 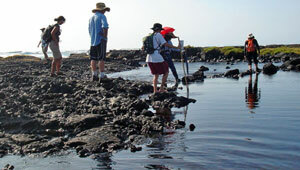 The land includes the two-acre Ka'alaiki intertidal fishpond, estuary, and spring system-the second-largest on the island. Also on the Kawa shoreline are numerous Hawaiian cultural sites, such as Ke'eku Heiau (luakini), one of the largest intact heiau in the region. In November 2011, The Trust for Public Land helped the county protect 550 acres of shoreline in the Ka'u District next to a popular surfing beach on Kawa Bay. This project creates a four-mile corridor of publicly owned coastal land along the Ka'u coast.